After a red card in England's draw with Montenegro, Wayne Rooney will miss the first one or two games (depending on a disciplinary hearing) of next summer's European Championship. 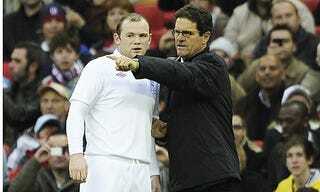 With three big warm-up matches before the tournament, England manager Fabio Capello is supposedly contemplating using Rooney as a sub, to give the starting XI for Euro 2012 time to gel. "Sometimes he will come on at half-time," Capello said. "But not from the start; he will not start. We need to prepare the first XI who will start in the Euros." Capello took it even further. If England should do well in its Rooney-less matches next year, there's no guarantee he would mess with success. "I need to find the solution for the first game or two games that Rooney would have played. And then if we find a solution he needs to work to return to the first XI." We can take this one of two ways. Either Capello is seriously willing to bench the best player in the country in the name of team chemistry, or he's using the oldest motivational trick in the book to light a fire under an immature star. Which one do you think will prove true? Spoiler: not the one The Sun is insinuating.